...because when I was a youngster I saw something like this. In my uncle Jack's pub. The pub sat opposite the pit, on the crossroads, at one end of a one street town. It was a treat to sit with a lemonade and listen to the banter of the men who had spent a day far beneath the ground. It was there I saw my first tattoos. I like the faded, old blue scratchy ones. Paul has a faded blue bird on either hand. When we met it was like he was wearing white tie. 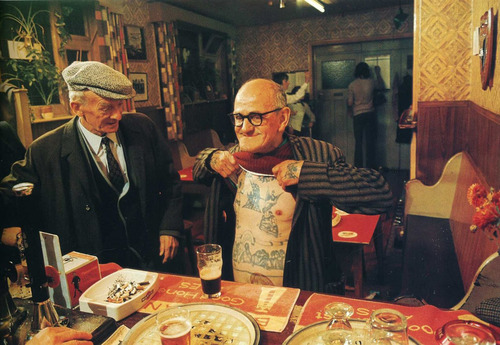 Whenever people express (idiotic) concern about 'how it will look when you are old' I always think of old blokes like the ones I watched in my uncle's pub and like this gent in the photo. They will look just fine. While I'm not planning on getting any tattoos anytime soon, I can understand the fascination (my namesake nephew wears an evil clown he requested I design for him some years ago). I'm charmed that your interest in the body art form began not out of whim or fashion but because of your personal environment at a young age. Just the thought of having a close relative who owns a pub has an indelibly romantic ring to it. Perhaps it was inadvertent, but your uncle supplied you with a very special gift, one to last you a lifetime. The praying hands on my chest was my first tattoo. The first thing that people said was, "OMG! HOW IS THAT GOING TO LOOK IN 20 YEARS?!!" I would reply with "Oh you shut up!" I had a wood shop teacher with in high school faded eagles on each fore arm. I thought that was the coolest thing.